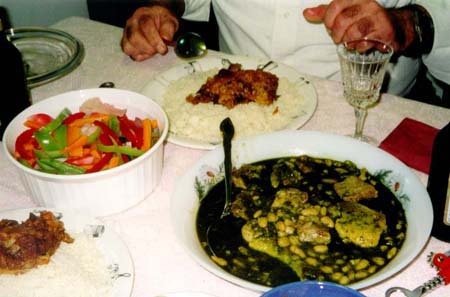 As children we called it the "green" beans (lubya hedra) to differentiate it from a similar dish made with a tomato base. Wash spinach thoroughly, drain. Saute in hot oil. Let cool, grind it in the processor. Cilantro, washed, drained and chopped. Green onions, cleaned and chopped. Water to cover all ingredients. Bring to a boil and let simmer about two hours depending on the size of the beans.